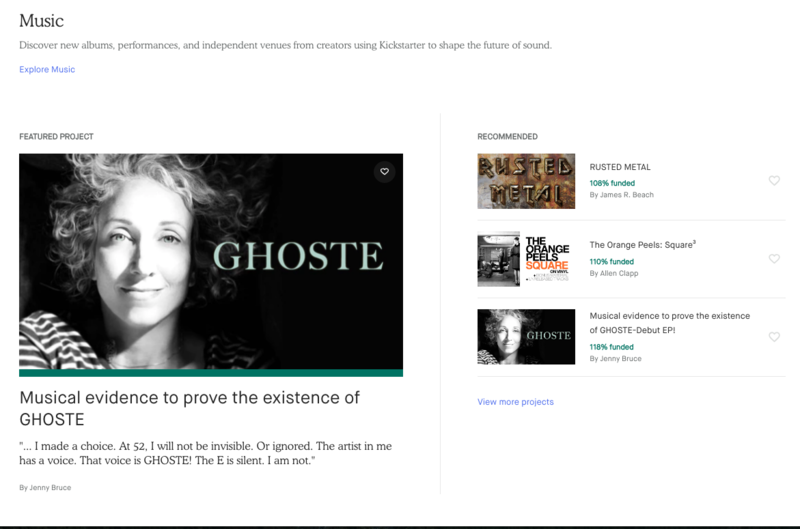 GHOSTE's Kickstarter Campaign featured on Kickstarter Music! GHOSTE is the musical chimera of singer-songwriter, Jenny Bruce and Producer, Composer, Matt Anthony. Together, they have collaborated for well over a decade on various musical projects at Engine Sound, Anthony's recording studio in Hell's Kitchen, NY. Often in between sessions, Bruce and Anthony exchanged stories about the daily triumphs and struggles of living a creative life. Conversations which would, depending on the often late hour, veer into the realm of things spooky, ghostly and fascinatingly weird. Jenny Bruce, is a New York City independent singer-songwriter. Bruce has released 3 full albums and and an EP. "Jenny Bruce" is also a wife, a mother of two boys, a full-time Communications Director, a grad-school student, and caregiver for her father who is in the end stages of Parkinson's. Immersed in the layers of a wonderful, busy, full life, Bruce realized that the artist in her was slowly becoming invisible. That triggered a memory of Bruce's mother telling her repeatedly that, "At 50, you become invisible. Nobody sees you or listens to you anymore." One night, Bruce had a very lucid dream. In it she was on stage. The lighting was dim and electric blue. A voice introduced her as "GHOSTE" and as it did, she saw the word (with the “E”) projected in bright letters behind me. Bruce says, "I made a choice. At 52, I will not be invisible. Or ignored. The artist in me has a voice. That voice is GHOSTE! The E is silent. I am not." Bruce finds it freeing to write and record in the blue glow of GHOSTE and the songs she's written for this EP are brimming with passion, melancholy, joy, and longing. Gifted producer and composer, Matt Anthony, brings his innovative textures and sounds (sampling a loon! - how a propos) and his boundless enthusiasm and creativity to the mix! EP coming fall, 2019 - unless you support the Kicstarter Campaign and you'll heart it before anyone else!